Greetings friends and readers. Lady Aisla MacKai is among the most fascinating men and women of fiction that The Tattler has been privileged to meet in recent memory. The basic facts concerning the lady are these: She claims to be more than twenty years old, but refuses to be more specific. I got quite the tongue lashing from her when I pressed her on the matter. She was born, and lived her entire life at Dungarob Keep, the ancestral home of the MacKai clan and the Barons who led them. She is black-haired, fair-skinned, gray-eyed, and (as Caibre MacFearann her fiancé told me), as fair a lass as ever graced the highlands. I must agree that his charming and challenging young woman is a most pleasant sight to behold. With that introduction, let us commence Lady Aisla MacKai’s interview. TT: “I understand now. A title must have been a great inducement to a second son, especially when accompanied by your lovely self.” (Lady Aisla sits opposite me blushing whether from my poor attempt at a compliment or anger over the implication that a title is needed before a man would wed her, I cannot tell.). TT: She grabs her reticule and departs before I can soothe any ruffled feathers. I’ll be honest, I’m not quite certain what I did to set her off so. If any of you readers would like to help me understand, please address a comment to Mr. S. Clemens, care of The TeaTime Tattler. *A note for our readers. Shortly after The Bluestocking Belles announced the future release of Follow Your Star Home, a storm of protest erupted from those who protested that the book was too scandalous to read. Supporters of the Belles, responded in strength and numbers. The Tattler, in fairness, published all communications received on the subject. The book has now been released to great reviews. So you could very well judge for yourself. Below is some information about Follow Your Star Home, A Wish for All Seasons (Mrs. Allyn’s contribution to the collection) about Mrs. Allyn herself, and The Bluestocking Belles. As always our readers’ comments are welcome and appreciated. 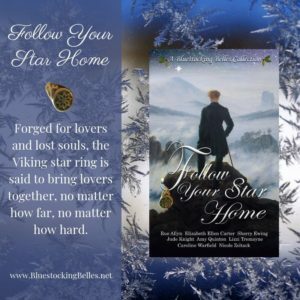 About Follow Your Star Home: Forged for lovers, the Viking star ring is said to bring lovers together, no matter how far, no matter how hard. In eight stories, covering more than half the world and a thousand years, our heroes and heroines put the legend to the test. Watch the star work its magic, as prodigals return home in the season of good will, uncertain of their welcome. 25% of proceeds benefit the Malala Fund. About A Wish for All Seasons: The last thing Caibre MacFearann wants is to return to Scotland let alone be forced to stay there. But the chance to rekindle the lost love of his youth is too tempting to resist. Losing Caibre MacFearann’s love once hurt so much that Aisla MacKai wants nothing to do with him when a blizzard brings the man to her doorstep. Kindness and human charity require that she give him shelter, no matter that her poor heart had never mended. About Mrs. Rue Allyn: Rue Allyn is the award-winning author of heart melting historical and contemporary romances. A USN veteran with a Ph.D. in medieval literature, Rue has retired south of the US border where she basks in the glow of sunny days and heated inspiration. 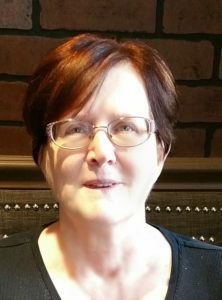 She continues to enjoy professional relationships in the Romance Writers of America, The Maumee Valley Romance Authors Inc. and the (in)famous Bluestocking Belles. The Belles are ten very different writers united by a love of history and a history of writing about love. From sweet to steamy, from light-hearted fun to dark tortured tales full of angst, from London ballrooms to country cottages to the sultan’s seraglio, one or more of us will have a tale to suit your tastes and mood. We love doing joint projects. This year’s boxed set is Follow Your Star Home, Eight original stories, more than 600 pages of diverse characters, complex relationships, and happily ever afters. Divided sweethearts seek love and forgiveness in this collection of seasonal novellas. Forged for lovers, the Viking star ring is said to bring lovers together, no matter how far, no matter how hard. If you’d like to learn more about us try searching these links.